What determines who texts me in Hawaii? I'm now nearing the end of my NG+ run and I just got back from Hawaii (in-game). 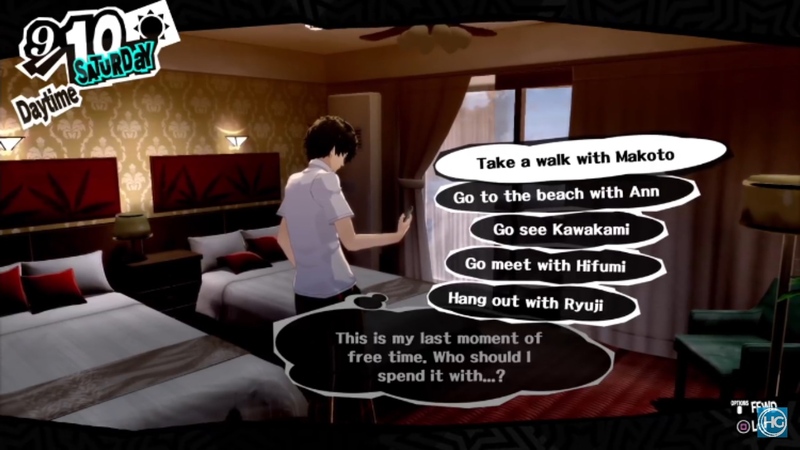 On the last night of the school trip, you get a text from a girl about spending time on the beach together after Ryuji invites you to find girls since he struck out earlier. My first playthrough, I received a text from Makoto, who I think was my highest ranked Confidant at the time, so that made sense. However, this time around, I've maxed both Ann and Makoto's Confidant ranks, while Hifumi was only at 7, yet Hifumi was the only one who texted me. What determines who you get a text from? It looks like only one girl will text you. Apparently, it's possible for multiple girls to contact you for this date (though it never happened for me, strangely). This can be seen in this video. Here are the conditions for events during the Hawaii trip. Considering I wasn't romancing Ann or Kawakami at the time, this lines up with them not contacting me, despite having reached max rank with Ann. As for Makoto, I may not have been invited by her because I'd declined her romance already. Otherwise, this seems to check out. Not the answer you're looking for? Browse other questions tagged persona-5 or ask your own question. How do I know what to say to enemies? What days will I be able to read on the train? Why is the experience a character gains different from what is reported at the end of battle? What all carries into New Game+? In what ways are the individual Persona games connected? Is the result the same regardless of who you choose to confess your love for if you go with Ryuji on the October 26th post festival party?